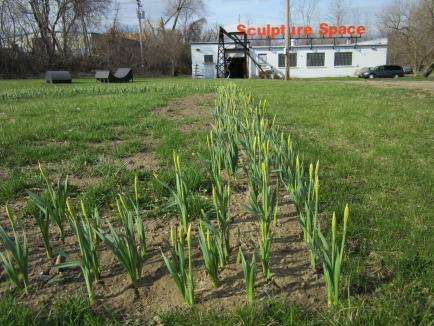 Mission: Sculpture Space is unique in North America for its support of sculptors, both those who come to Utica, New York, as residency participants and those who continue after their residencies as working artists. The organization selects 20 artists each year for two-month residencies and has helped to advance the careers of more than 500 national and international artists since 1976. A non-profit organization with a 35-year record of success, Sculpture Space also offers the public a valuable opportunity to meet innovative artists and to learn about contemporary sculpture. As a unique cultural resource, Sculpture Space promotes interaction between national and international visiting artists and the local community throughout Utica and the surrounding region. The organization places works in the public domain, hosts studio tours, welcomes school groups to meet and watch working artists, collaborates with other organizations to exhibit artists’ projects, and arranges lectures at area educational institutions including Colgate University, Hamilton College, Syracuse University, Pratt at Munson Williams Proctor Institute, Mohawk Valley and Onodaga Community Colleges and Utica College. The Sculpture Space facilities comprise a 5,000 sq.ft. open space designed for flexible use, equipped with concrete floors, two enclosed private studios, a two-ton system of hoists for lifting and moving large and heavy materials, extra-wide overhead doors for easy access, and nearly three [3/4] acres of land to supplement indoor studio space. practice: 1. A partnership with the Mohawk Valley Resource Center for Refugees (http://www.mvrcr.org/) that pairs individuals, artisans, craftspeople and artists working with the Center with an Artist in Residence to create/realize new collaborative works/project; 2. A partnership with the Oneida County Health Department Community Garden’s (http://www.ocgov.net/sites/default/file/Utica_garden_map.htm) for multiple neighborhood outreach projects in collaboration with community gardener groups and an Artist in Residence; 3. A partnership with local recyclers and the Oneida-Herkimer Solid Waste Authority (http://www.ohswa.org/facilities/recycling-center/) for materials to be used by an Artist in Residence to create/realize new collaborative works/project (including public art installations as appropriate/possible). If you are interested in applying for any/all of these partnered residencies, please email us your project description/scope/details and include an ideal budget, schedule and timetable (along with cv, images and 3 reference names/emails/phone numbers). Please note that in applying for these residencies, you may extend the residency as needed (and/or come and go) as the project dictates. Please note that we may be able to grant necessary funds to cover housing and related costs (food, travel, childcare, etc.) for artists with children. Cost: Artists are expected to take advantage of the support we provide—funding, housing, 24/7 access to the studio, technical assistance—to more fully develop their practice and create new work. Accommodations: Artists live in a newly renovated Sculpture Space-owned apartment located one block from the studio with shared fully-equipped kitchen, bathrooms and laundry. Non-New York State artists are assessed a nominal rent. Artists are responsible for their own meals. No pets are allowed in the studio or the artists’ apartment. The studio is located in downtown Utica, New York, in proximity to light industry and various fabrication shops. The facility consists of 5,000 square feet of open studio, and two 400 square foot private studios for special projects. The space is outfitted with concrete floors, a two ton system of traveling hoists, and extra wide overhead doors. The studio has wireless access, and the Artists Office has DSL and a G4 computer; artists may borrow available digital equipment. The 3 acres of land that surround the building can supplement indoor studio space in the summer. An outdoor work pad is equipped with a 50′ monorail hoist.Sculpture Space is a founding member of the New York State Artists Workspace Consortium, and the Alliance of Artists’ Communities. Benefits: Residents have access to the studio 24 hours a day, seven days a week. They are responsible for their own materials, specialized tools, fees for work done outside the premises, and for an assistant, should they require one. Residents typically spend approximately $1000 per month on materials and expenses. A basic command of the English language is necessary. Bicycles are provided, and a shared car is available for local travel. Accepted artists are selected by a Review Committee. A guest juror is also included, this year: Anja Chavez, Director of the Picker Art Gallery at Colgate University in Hamilton, New York, former Director/Curator of the Warehouse Gallery in Syracuse, New York. Artists are notified at the end of January. Primary criteria for selection are based on the quality, originality and potential of their work and proposed project. Posted in Inc., New York, Sculpture SpaceTagged 2 months, Alliance of Artists' Communities, apartment, art residency, Artist, Artist Residency, artists, bathrooms, career, Colgate, college, Colleges, community, concrete floors, contemporary, digital equipment, domain, Environment, equipment, experimentation, extra-wide overhead doors, fabrication shops, Fellowship, flexible use, funded, funding, galleries, groups, Hamilton, heavy materials, housing, indoor studio space, industry, innovative, Institute, International, kitchen, laundry, Mohawk Valley, moving large, Munson William Proctor, museums, national, new, New York, New York City, New York State Artists Workspace Consortium, no pets allowed, nominal rent for international residents, non profit, North America, Onodaga, open space, Pratt, private studio, private studios, public, Rate My Artist Residency, resources, responsible for their own meals, school, sculptor, sculptors, Sculpture, sculpture parks, Sculpture-based, space, special projects, Stipend, Studio, Syracuse, technical assistance, tours, two-ton system of hoists, University, Utica, visting artists, wireless, work-in-progress, working, worldwide, YorkBookmark the permalink.